Read while flag is gradually unfurled. Traditionalists say I was born of a woman's hand . . . fashioned from bits of colored cloth by a seamstress in a small house in Philadelphia, a year after the new country was born. Historians are less certain of my origin. Yet, no one doubts my existence. I was created out of necessity to serve as the emblem of a people whose experiment in nationhood was as unique as the arrangement of my stars and stripes. I have proved my adaptability to change. I've accommodated growth. I've stood up to time and troubles. I fluttered in the Fall air with General Washington and his loyal French allies at Yorktown. My fabric was shredded by cannon balls from British frigates in the War of 1812 and I was carried in triumph by Andy Jackson at New Orleans. The British could see me clearly in the mists of 'dawn's early light', waving from the standards at Fort McHenry. I am part of political campaigns, holidays, and ice cream socials. I fly from skyscrapers and bungalows. I've been to the moon and the ocean floor. I decorate bandstands and concert halls. I am saluted in parades, in schools and at ball parks. I am everywhere my people are. I am saluted and, occasionally, scorned. I was created to serve a people in a struggle and a government in change. There are now more stars in my blue field than there were in the beginning and, if need be, there's room for more. But, those red and white stripes remain as they've always remained clearly visible through the struggle . 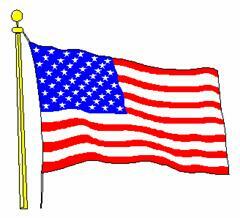 . . the symbol of the "land of the free and the home of the brave". I am your past. I am your future. I am your flag! I've witnessed turmoil and bitterness, even lost some of my glory in a mid-century war between brothers, but I was restored as the nation's emblem at Appomattox. I traveled west with the new frontier. I flew from the headlands of the Iron Horse in Utah. I was with the prospectors at Stutter's Mill, with the cavalry against cattle rustlers, with the Rough Riders at San Juan Hill. I crossed the Marne with the doughboys anxious to make the world safe for democracy. I was raised over a shell-pocked hilltop at Iwo Jima and stood by the grim faced negotiators at Panmunjom. I was on that last helicopter from Saigon. I have been around in victory and defeat. I've seen pain and pleasure. I've been folded smartly by soldiers and handed to weeping widows. I've covered the coffins of those who've served country and community. But I also decorate bandstands and concert halls. I am saluted in parades, in schools and at ball parks. I am part of political campaigns, high holidays, and ice cream socials. I fly from skyscrapers and bungalows. I've been to the moon and the ocean floor. I am everywhere my people are. I am saluted and, occasionally, scorned. I have been held with pride and I have been ridiculed because I am everything my people are: proud, angry, happy, sad, vengeful, argumentative, ambitious, indifferent. But, those red and white stripes remain as they've always remained, clearly visible through the struggle . . . the symbol of the "land of the free and the home of the brave". Used by permission with grateful acknowledgment to Bob Nelson, KYW Newsradio, Philadelphia. Copyright 2001-2010, CBS Radio. All rights reserved.